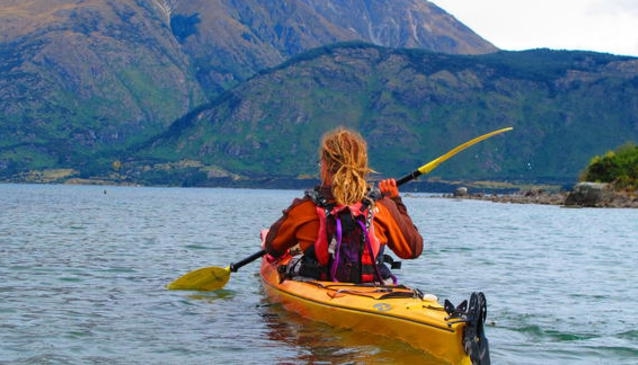 Dedicated kayak adventures across Lake Wakatipu at Glenorchy. Choose from a safari, or a paddle with dinner thrown in. Professional, friendly and enthusiastic team, a unique experience. Rippled Earth has been operated by Sam de Reeper since 2007. Addicted to the great outdoors, Sam set up the company after obtaining a Conservation and Ecology degree. His mission in life is to introduce visitors to the incredible scenery and wildlife around the islands of Glenorchy. His kayak adventure tours are the perfect way to do just that. There are two tours on offer. The Glenorchy Islands Safari is a half day trip (morning or afternoon), beginning with a stunning 45-minute paddle across Lake Wakatipu. You'll arrive on a secluded beach at either Pig Island or Pigeon Island. Then, you'll be taken on a guided walk through the beech forest, well off the beaten track, so you'll have it all to yourselves. Get your camera ready to snap some rare and endangered wildlife, particularly the New Zealand Weka. Then you can enjoy some refreshments on the beach (provided), and soak up the solitude in front of the serene lake waters. Don't get too relaxed, though - you have to paddle back, too! The Kayak and Dinner on Sunset trip offers a lovely evening paddle across Lake Wakatipu (45 mins). The destination is the beautiful heritage building of Kinloch Lodge. Here, you'll change into your 'posh togs' and prepare for a delicious dinner served up by the Lodge's head chef. Afterwards, get ready to enjoy a wondrous paddle back to Glenorchy, through the twilight waters of the shimmering lake. Dinner on sunset trip is for group bookings of 4 or more and available from 1st December to 15th of March. For both trips, all you need to bring is suitable clothing, sturdy footwear, sunglasses, sunscreen, camera, and a sense of adventure.